The parasitoid fly Ormia ochracea acoustically stalks signaling male field crickets and lays live larvae on and around them. Ormia ochracea have been observed to acoustically stalk various cricket species. In Texas the natural host of this fly is Gryllus texensis (Orthoptera: Gryllidae). Two larger potential gryllid hosts, Gryllus assimilis and the undescribed G. sp. #45, have been found in the same mating territories as G. texensis and therefore have the potential to be parasitized as well. It is unknown, however, whether O. ochracea can successfully survive in G. assimilis and G. sp. #45 hosts. We manually parasitized G. texensis, G. assimilis, and G. sp. #45 to compare parasitoid survival rates at different stages of parasitoid development. Ormia ochracea had the highest survival rate in males and females of its natural host, G. texensis, survived at about half the rate in female G. sp. #45, and survived at about one quarter the rate in male G. assimilis. No parasitoid flies survived through eclosion in male G. sp. #45 or in female G. assimilis. 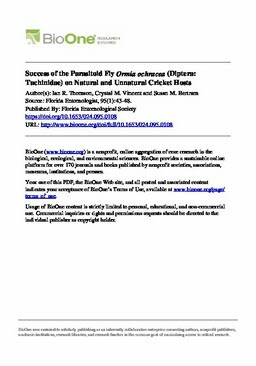 Our results indicate that larvae from this population of O. ochracea show highest survival in the natural host and show limited survival in other potential host species.